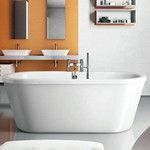 Scroll down the page to read through all of the tub information or use the links below to learn about size considerations, differences in tub style, or common tub options. 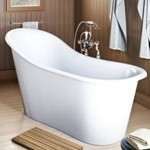 When planning for a bath the first worry is the over all size of the tub. Will it fit into the space restraints? Will it fit through the bathroom door? Will it be a comfortable fit? A little bit more about the height of the bathtub. 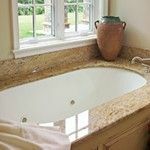 Tall tubs are great for a tub only, giving a deep water level on the inside. Shorter ones are great for tub/showers since you are not climbing over a tall rim on a daily basis. 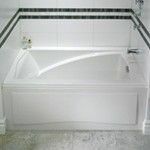 When used as a tub/shower we suggest to keep the height around 20". There is a difference between bathtub height and water height. 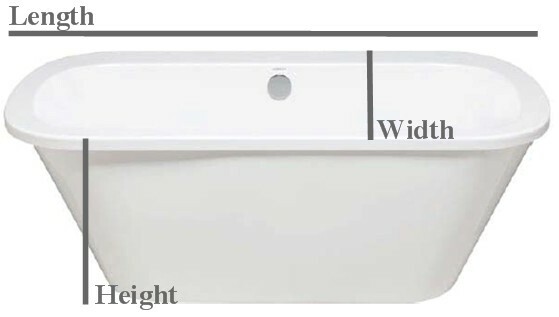 The bath height is from the bathroom floor to the top of the tub rim - step over height. The water height is from the floor of the tub to the bottom of the overflow - soaking depth. How large of a bathtub to bathe comfortably? Bathing well is measured at the bottom of the bathtub - the length and width of tub floor. 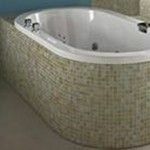 To see if a tub will fit for you - lean or sit against a wall and measure from the wall to your toes. Check this measurement against the tub's technical sheet for comparison. Will you be able to stretch out sufficiently? Is it wide enough to sit comfortably? Also think about how you lounge. Do you sit against the back slope or do you slouch? I slouch down into the bathtub, making the length of the bathing well not as important as the width and water depth. Another useful measurement is water capacity. Does your water heater have the needed capacity for the tub? Many things affect this; temperature of water supply, temperature the heater is set at, distance of heater from tub and on and on. I found two general rules of thumb: 3/4 and 2/3. - The capacity of the hot water heater needs to be 3/4 the capacity of the bathtub. If the whirlpool is 100 gallons the heater needs to be 75 gallon. - In the second opinion the heater should be 2/3 of the capacity of the bathtub. If the whirlpool is 100 gallons the heater needs to be 67 gallons. - So expect a 100 gallon bathtub to take 67 - 75 gallons of hot water. 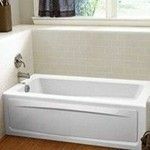 A two person tub will have a center/side drain and two back slants so bathers can sit face to face. Or it will be a really wide tub so two can sit side by side, drain will be at one end. There are few tubs that will break these rules. NOTE: just because the tub is designed for two, doesn't mean two can actually fit. 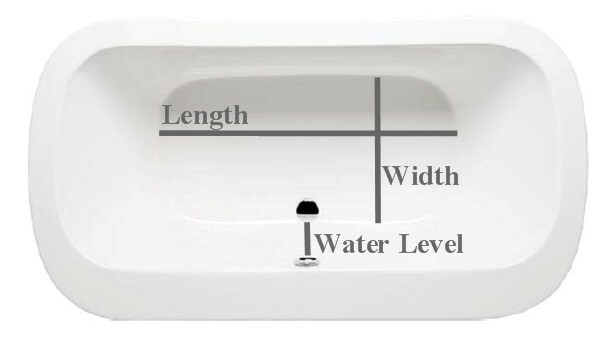 Use the technical for the bath to find out the bathing well size and water height. This will let you know if two can truly fit. 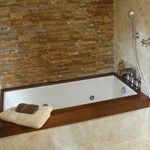 Perfect for Tub/Shower Combinations - An alcove requires a rectangular bath placed between three walls. Two features related to alcove installation are tile flanges and front skirts. A skirt hides the underneath of the bathtub in the front. 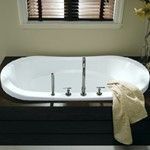 The skirt can be integral to the tub - all one piece. Other skirts are removable or have removable panels to provide access to equipment. There is also the option of creating your own tile or wood front skirt. A tile flange is used when the walls surrounding the bath are going to be tiled down to the rim of the bath. Perfect for tub/shower combinations. 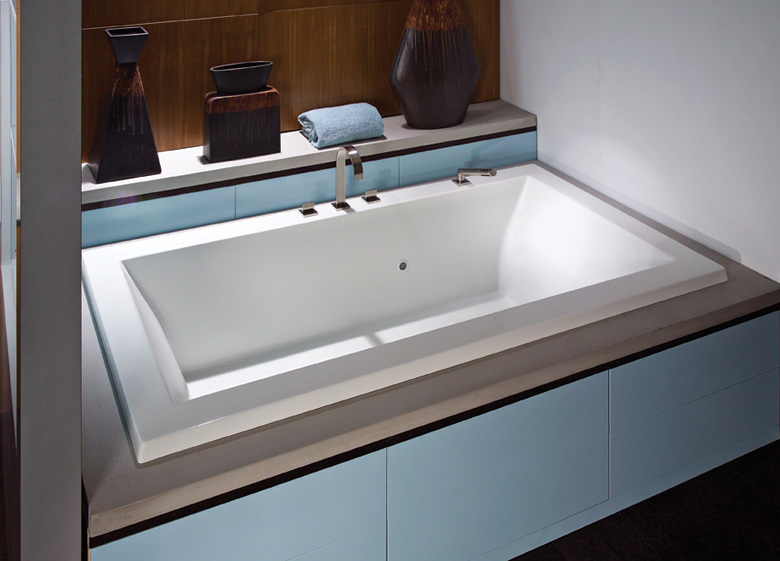 A drop-in bathtub can be any shape. A deck is created (with an opening in the center) and the bathtub is dropped into the surround. The tub sits on the bathroom floor (not hanging from the rim). The size of the deck is a matter of preference. A lot of pictures will show a wide deck, which can look beautiful, but others don't have the room for a wide tile area. In the second picture (below) the tile decking is kept flush to the bathtub rim. This can be more difficult on a whirlpool bath since the piping takes up room under the rim. Access will be needed for a system tub with a motor or pump. The rectangle tub in the 3rd picture shows a small deck. Easily done due to the wide rim on this bath. 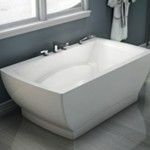 An undermount bathtub requires a flat rim, any bath shape. The bath edge is under the deck material making the rim of the bath invisible. Make sure to order as an undermount so the electronic controls will either not be installed or installed in a location that won't interfere with the under mounting. The 1st picture below shows an undermount done with stone, the 2nd with wood. Freestanding bathtubs are installed away from the wall, even in the middle of the room. Also called a Floor Mount Tub, they have a skirt that surrounds the entire bath. 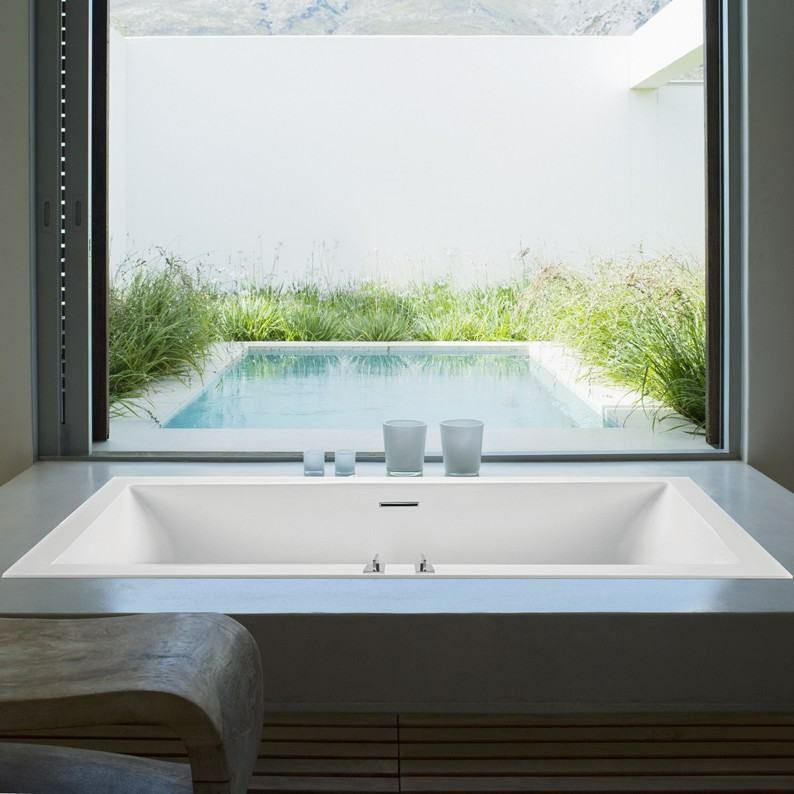 No two freestanding tubs are the same. All are offered as a soaking bath, most are offered with an air system, and very few as a whirlpool. They can made from acrylic, solid surface, copper or cast iron. Japanese style tubs are small and deep. They are designed with a seat(s), allowing bathers to sit comfortably in deep water. Sitting in a Japanese bathtub is like sitting on a chair. Walk In bathtubs are designed for easy access. Many of these tubs have a chair-height seat and safety features such as anti-slip floors and grab bars. 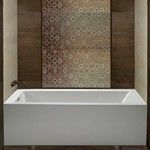 Walk In tubs require a similar amount of space as a traditional bathtub. The front skirt and tile flange allow for an alcove installation. 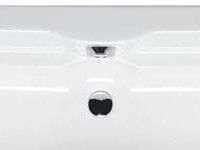 Access is offered through a front access panel for a system tub with a motor or pump. 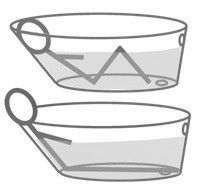 What Tub Options are Available? There is also the possibility of front and side skirt (shown below), or even skirted on all 4 sides making the bath tub freestanding. Bathtubs will come with a hole drilled for the drain (in the bottom of the tub) and one for the overflow (side of the bath). A drain and overflow will be needed to fill these holes. In most cases they come as a set. Lift & Turn Drain- Reach down to the bottom of the tub and lift and turn it to open the drain. The overflow cover is a flat round disc. Cable Waste & Overflow- Reach just below the rim to the overflow, turn the overflow (dial) and a cable will open and close the drain at the bottom. Toe Tap- Step on the drain to lock it shut, step on it again to open it. Overflow is a flat round disc. The rim stands about 1 3/4" above the tile surround on most drop-in bathtubs. Many companies now offer a slimmer profile - lower rim height option - approx. 9/16" tall.